A good laugh is a wonderful way to relief built up stress and tension only a few people know how to elicit. Aziz Ansari is one of those blessed with the ability to make others laugh and in doing this, he has received accolades such as the Emmy and Golden Globe Awards for various works he was part of. He is an Asian-American standup comedian, actor, creative writer, film producer, and director. Aziz gained prominence after he played Tom Haverford in NBS television series drama titled Parks and Recreation which was aired from 2009 to 2015. His full birth name is Aziz Ismail Ansari born in Columbia South Carolina, the United States of America on the 23rd February 1983. He grew up in a Muslim home in Bennettsville, South Carolina, the U.S with his family. Aziz Ansari had his high school education in 2 schools; Marlboro Academy and South Carolina Governor’s School for Science and Mathematics before proceeding to attend the New York University Stern School of Business where he bagged a degree in Marketing. His first comedy special dropped in January 2010 titled Intimate Moments For A Sensual Evening, he followed it up with Dangerously Delicious which he released on his website in March 2012. The successes of his previous 2 works inspired him to produce others like the Buried Alive in 2013, Live at Madison Square Garden (Netflix release) 2015, and his book Modern Romance: An Investigation which he co-authored with Eric Kilnenberg was published as well in June in the same year 2015. 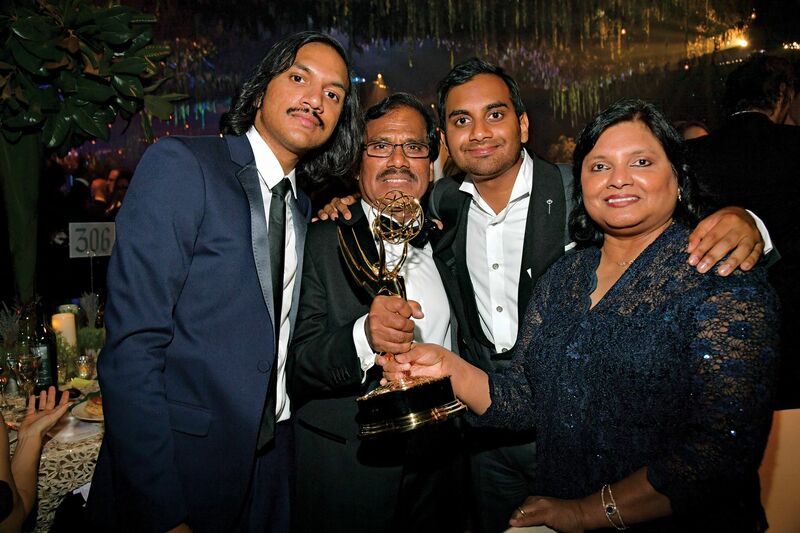 Aziz Ansari haven established himself firmly in the entertainment industry, took the role of Dev Shah in a 10 episodes hit series Master of None and he also directed some of the episodes while the storyline was written by him, Alan Yang and his younger brother Adam. The film series was well received and critically acclaimed a success in November 2015 after it debuted. The Master of None garnered him 4 Emmy Awards nominations and a Peabody award. His 2nd season outing of the Master of None was certified 100% fresh by Rotten Tomatoes and was well received publicly after it hit the screens in May 2017. Aziz Ansari finally clinched the coveted Golden Globe award making history as the first Asian-American actor to win it in 2018 in addition to his earlier recognition in 2016, as one of Time 100 Most Influential People. His parents are Fatima and Shoukath Ansari, they are from the Tamil Muslim family in one one of the largest cities in India. His parents are in the Medical line with his father a Gastroenterologist Physician skilled in the treatment and management of digestive issues while his mother Fatima practices as an Obstetrician and Gynecologist. His parents are ardent fans, followers of his works and they even made an appearance in season 1 and 2 of Master of None and have been supportive of their son’s choice of career. His younger brother, Aniz Adam Ansari popularly known for his role in Forever (2018) was also one of the brains behind the success of Netflix film Master of None made by his brother Azizi. He is 7 years younger than Azizi but has distinguished himself already as a good writer, visual artist, and an actor. Who is Aziz Ansari’s Wife or Girlfriend? Aziz Ansari is currently not married but was once in a serious relationship with a professional Chef Courtney McBroom who he met in August 2013. Their relationship was widely followed by their fans and they even co-authored a relationship book before they sadly called it quits in January 2016 due to Aziz unavailability because of his work schedule. The self-acclaimed feminist got himself in a not too good situation after his breakup. In January 2018, a post from a lady he apparently went on a date with surfaced online and had the lady accuse the 5 feet 5 inches tall humor merchant of inappropriate sexual behaviors and sexual misconduct. Ever since then, his love interest has not been known.